Are disabled people’s employment rates improving? Does the type of work differ for disabled people? Does the experience of work differ for disabled people? How can unions support disabled employees? How widely adopted are disability equality policies and practices? Disabled employees are found to recount a more negative experience in terms of changes to workload, work organisation, pay and access to training during the recession. This does not reflect the concentration of disabled employees among jobs and industries which have been more affected by the recession because we control for this. 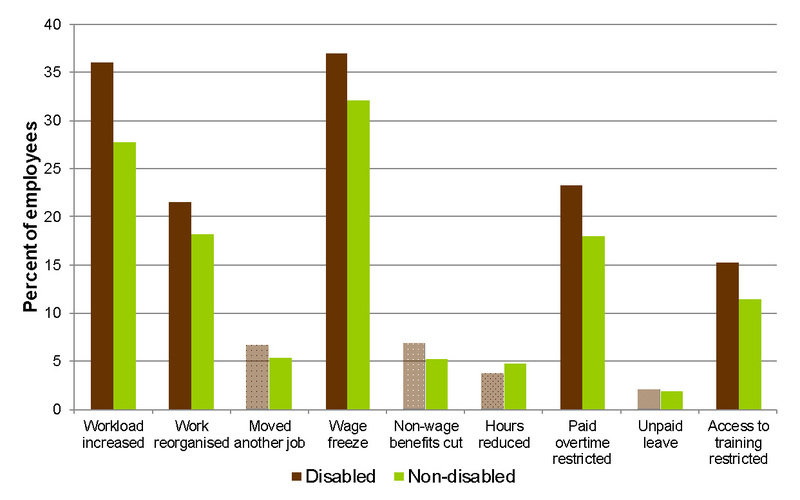 The impact of factors traditionally associated with reduced disadvantage for disabled employees such as employment in the public sector, union representation and the number of equality practices was found to have only a limited positive impact on the relative experience of disabled employees during the recession.